Each fall parents and professionals who specialize in supporting students with hearing loss wonder if there is a better way to get across the unique learning needs of these children. View this one-hour YouTube video produced by high-school junior, Zina Jawadi, who has a moderate-severe hearing loss. The video is narrated by Zina and features her teachers speaking on how classroom teachers need to adapt and accommodate for the student with hearing loss. This very positive video is conveniently divided into 17 sections and the material provides an excellent outline for teachers or parents to share with teachers, even if time is not taken to watch the full video. This link has some great inservice and ‘how to’ videos, along with cheatsheets that can be sent to classroom teachers on topics such as changing batteries, attaching FM audioshoes, and equipment-specific information. Thanks to Amanda Ball Levy, AuD for making these videos available! Quick 4-slide Demonstration Be sure to include this 4-slide PowerPoint show with embedded audio files as you inservice teachers. You must show it as a PowerPoint slide show to be able to hear the various simulations. It simulates the effects of distance, high and low frequency listening and reverberation. Classroom Acoustics 4 slides Our thanks to Phonak for the original materials. 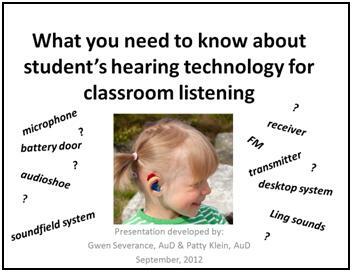 Here are a few suggestions on what you can present to classroom teachers to make the case that the student with hearing loss needs accommodations to access classroom instruction so that they can keep pace with learning to the best of their ability. 1. Demonstrate the hearing loss. Experience via simulating hearing loss is a better teacher and gets the point across more effectively than handouts or explanations. You can enter a student’s hearing thresholds and produce an individualized simulation or use a recording. As the teacher listen’s make a bit of noise and cover your mouth when you talk so that these challenges can be experienced. 2. Share ‘real-life’ information. Many DHH professionals monitor student performance every fall (October), spring (May) and sometimes mid-year (January). It can be very powerful to share the student’s SIFTER results from the spring as you inservice the teacher in the fall. The same is true for the student’s end-of-year LIFE-R results. The identified listening challenges and use of self-advocacy skills show the teacher how the student has been performing. 3. Talk about the effect of hearing loss on learning as an access issue. Describing audibility and results of the functional listening evaluation can drive home the point of lacking access to equal information. The handout below may help. Many teachers think of these students as being learning disabled with hearing aids. Increasing numbers of students are entering school with age-appropriate skills. With equal access to verbal instruction, we can have much higher expectations for the learning outcomes of today’s student with hearing loss. 4. Describe the partnership of teacher and student. The teacher needs to provide accommodations and modifications as appropriate. The student needs to improve on his or her use of self-advocacy skills. Thanks to educational audiologists Gwen Severance and Patty Klein for sharing this interesting and informative presentation. 43-slide PowerPoint in a pdf format. There is also an 8-page handout (6/page) pdf. Hearing aids and/or cochlear implants do not restore normal hearing. Students who use hearing aids may not be able to hear all of the sounds of speech even when it is quiet and the speaker is close by. Hearing aids or cochlear implants allow most students to perceive speech occurring within a distance 3-6 feet. Imagine a transparent bubble over the student that is 6 feet in diameter. Any speech from farther away will likely be ‘heard’ but not all of the parts of speech will be perceived, like putting a puzzle together with missing pieces. In the classroom in this photo the student with hearing loss (who everyone is looking at) would be able to hear students right in front of him. The teacher’s voice would likely be heard but only at a soft loudness. Even teachers who speak loudly cannot make up for the effect of the hearing loss when the child is listening at a distance of more than arm’s length or a bit farther. You will be surprised sometimes to observe the student being able to ‘hear’ even when you think he or she could not have done so. Consider the brief children’s story in the yellow box. 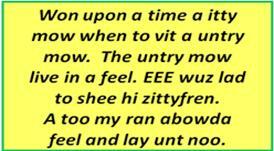 You can clearly read the words but endings are missing and the words are not as distinct so it takes extra time and effort to figure out the story, even if you are reading it carefully. This visual simulation is similar to the listening ability of a child with well-fit hearing aids (25 dB reduction in sound). The small font size represents that sound is perceived more quietly than it is for typically hearing children. Your student may ‘hear’ but not understand what was said completely because pieces are missing and it takes extra effort to do figure it out. Language delays make this even more challenging. 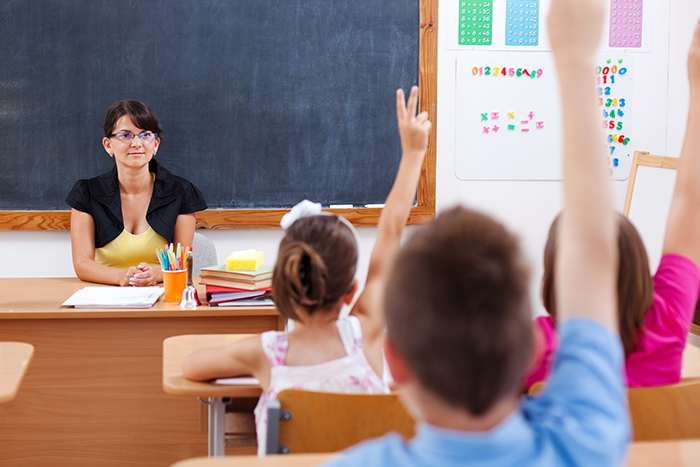 Your student with hearing loss may sometimes look as though he is not paying attention. What is probably happening is that he is working hard to listen and figure out what is being said for a period of time and then taking a bit of a listening break. The more effort spent listening, the fewer cognitive resources will be available for understanding and integrating new information into what is already known. Your student with hearing loss may need to hear something 5 times to ‘get it’ when peers may only need 1-3 times. Using an FM system is like having your voice a few inches from the student’s ear. consistently able to hear. As shown by the story, the student may still miss some speech sounds and have to work harder to understand, even with the FM. Pass the mic during discussion. Answers from class peers, quick conversations, jokes and many social interchanges between peers are often not able to be heard completely by the student with hearing loss. Assume that anytime a class peer talks that the student with hearing loss will NOT be able to hear or understand what was said, unless the peer is next to him. Repeat key points; rephrase using different words. Use the FM, including passing the microphone. Set up a signal so the student can let you know when he’s struggling. Identify a buddy that can repeat a page number or simple instruction but only as necessary – the student needs to learn to advocate for himself! Support better peer-to-peer communication by keeping the noise down. Help him fit in – hearing devices are like little computers and high tech phones rolled into one (cool!). Encourage him to become his own hearing tech specialist. Explain idioms, multiple meaning words, vocabulary – much of the time these are learned by overhearing others use it in daily conversations. Be in frequent contact with the person who specializes in working with students with hearing loss in your school or school district.